CFU – Colony Forming Units – is a term from the Microbiology. CFU gives an indicaton for the amount of living microorganism in a liquid. This number, determined by counting the individual colonies, describes the number of cells of organism in the water, which are able to multiply. The orgnaism are bacteria or fungi living and multiply in water. The colony forming units are important in the microbiology, to see for instance the development of a cell culture. But also to find out how much microorganism are in water. For the measurement of the CFU it is necessary to consider a period of time. A single bacterium can quickly become a whole colony. The measured value at one time, is not enough. It is always measured over a period of time. This is done in order to see how quickly bacteria develop and what danger this water poses when drunk. To ensure comparability of different analysis, these CFU results are always referred to colony forming units per 100 ml. In 1892 there was in the city of Hamburg, Germany, at the Elbe river an outbreak of an infection. This was caused by bacteria, coming in the Elbe togehter with sewage from a refugee camp. During this outbreak around 7000 people died. Robert Koch, the later noble price winner for medicine, investigated this case. Koch tested the microbiology and he found a lot of bacteria in the water. At that time the drinking water was taken directly from the river without any purification. To ensure the public health Koch recommended filtering the water, before use. To keep the bacteria in the water at less then 100 ml/cfu. This standard for colony formation units, which was introduced at that time, is still used worldwide today. 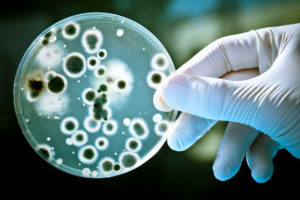 Bacteria or fungi in drinking water can endanger the health of the consumer. Therefore drinking water is strictly monitored. In recent times, even cooling water has also come into focus. There are corresponding regulations at national or European level, where the permitted limit values of the colony forming untits for the each water is described. The German Drinking Water Ordinance is based on the EU Drinking Water Directive and the Infection Control Act. In the United States this is regulated by the EPA – Environmental Protection Agency. In its recommendation on drinking water safety, the World Health Organization (WHO) recommends the same limit values for the CFU. How the sampling must be carried out is also regulated in the Drinking Water Ordinance. The sampling and analysing should be done always in the same procedure. Only then an accurate comparsion in between different samples is possible. It has to be ensured the water samples are taken always under the same condition. It has to be ensured the water sample is analyized as soon as possible after sampling. A water sample kept in a car standing in the sun for a few days, will develop a lot of bacteria before testing. Compared to a sample kept in a cooled environment and put for testing short time after the sampling. The water sample is given in a so called Petri dish. The sample is kept for a certain time at a defined temperatur. The microbes in the water breed. The result can be visualized in a petri dish. The colonies can be counted one by one. In most cases this is done manual by a certified laboratory. The petri dish is transparent, as seen in the photo. Putting light behind, the cells or the colonies are easy visible. The counting of the cell is either done direct or if there a lot of small cells using a microscope. Testing for instance waste water, a high quantity of microorganisms in the water is to be expected. In order to obtain usable results, the water sample can also be diluted. 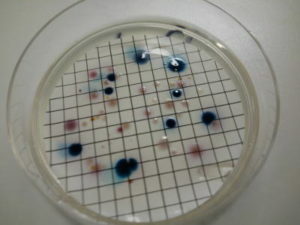 The dilution hold less microbes and will give a clearer result. After a defined time, under standardized conditions, the number of CFUs in the water can be calculated. Of course considering the dilution done before. The result is given in cfu/ml. For drinking water the upper limit is 100 CFU/100 ml. Cooling water should contain not more than 10,000 CFU / 100 ml. One might ask, why to check cooling water as it is not used for drinking. The reason, one can find Legionalla in cooling water. An infection usually occurs through the inhalation of aerosols containing Legionella, but also the aspiration of contaminated water. Means standing in the wind drift of a cooling tower might lead to an infection. These limits are set and controlled by the authorities. There is no uniform and binding international standard, the values may vary from country to country.